I couldn't do a serious sketch of our newspaper, because I never read it. The New York Times is delivered to our apartment by 6:30 each day and I dutifully bring it inside for my husband. However, I have many things to do that are higher on my personal priority list and I get my news from the WNBC Early Morning Show, WNYC NPR radio during the day in my office, and the Lehrer news hour in the evening. 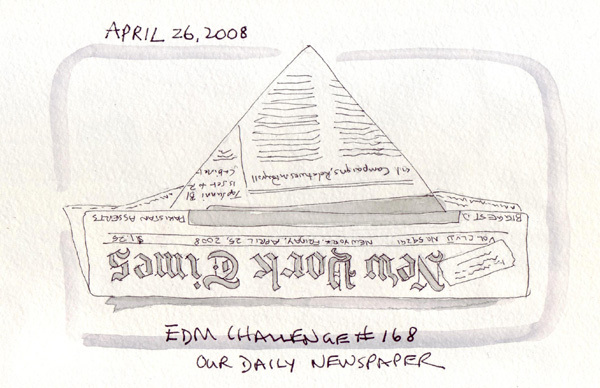 So with this challenge, I bring you a charming paper hat made from the front page of yesterday's newspaper! Clever girl! Love your approach to the challenge. Fun, fun, fun! I thought of doing something similar, but have had eye troubles this week, I think I'll just enjoy your interpretation. LOL Very cute and clever! lol! great take on the subject Shirley, and beautiful lettering of the masthead. I also enjoyed reading about news consumption in your household! What a FUN approach to this rather bland challenge- such fun, and you are so right about that NYT banner and now much we miss in our everyday lives - Great spin and a fun hat for one of the grandkids . hee-hee-hee! Perfect!!! I love it! Great take on it! A cute sketch Shirley and great work on the lettering! Love the idea of a paper hat (brings back memories from long ago when they were all that was available for parties) and think the text is amazingly good especially the newspaper title.